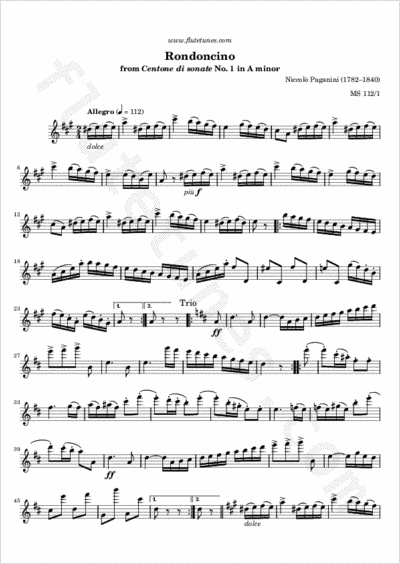 Paganini launched his set of 18 “medleys of sonatas” (as the group is sometimes translated) for violin and guitar with a typically charming three-movement duo that really has nothing to do with sonata form: in fact, it is merely a series of entertaining salon pieces. The final movement of this first “sonata” carries the odd designation of “Rondoncino”, which literally means “small rondo”. It's an easygoing Allegro whose recurring refrain is full of little turns. The succeeding sections involve some decisive attacks and an extended pizzicato passage, but nothing nearly as difficult as what Paganini concocted for concert use.